According to a recent article in Fashionista magazine, an increasing number of people are turning to Botox wrinkle fillers, not just because they want to make the most of the anti ageing properties they provide, but also because this treatment provides an effective way to clear up oily skin. So, if you’re frustrated because you’ve been struggling to find products at your pharmacy that actually do what they claim, wrinkle fillers may be the answer. It’s a great way to clear up an oily T zone and smooth over your prominent facial lines at the same time. Many over the counter products that claim to cleanse T zones, or creams that inform you they can reduce your visible signs of ageing do not contain enough active ingredients to be effective. This is because these products are being sold to customers who are not qualified to apply anything with a bit more kick to it. Choosing to have a cosmetic treatment from a qualified professional practitioner already puts you at an advantage. You don’t have to worry about getting the application technique right and the product used will be far more active and capable of more dramatic results. It’s our Botox injections that can also reduce oil production in the forehead area. As this treatment interrupts signals from the nerves, which tell the muscles when to contract, sweat and oil production is also affected. It’s all to do with the same set of glands being affected. Botox is predominantly used to smooth over forehead lines and frown lines (the vertical lines between your eyebrows, also known as glabella lines). If you need wrinkle fillers on the lower face, then it’s actually a different treatment you require. It’s dermal fillers, which will fill in nasolabial lines and marionette lines, as well as plump up areas of thinning skin, such as under the eyes, or around the cheeks. In this procedure, it’s hyaluronic acid, rather than Botox that is the main ingredient. The hyaluronic acid takes on water under the skin and provides a cushioning effect. Please bear in mind that dermal fillers will not affect oil production on your face. How are wrinkle fillers are applied? Both Botox and dermal fillers are administered by injection, by one of our trained and experienced practitioners here, close to the boroughs of Chelsea, Kensington and Mayfair. We use ultra fine needles, directed into a targeted area of the face and although most of our customers report no pain at all, we can use a local anaesthetic on request. 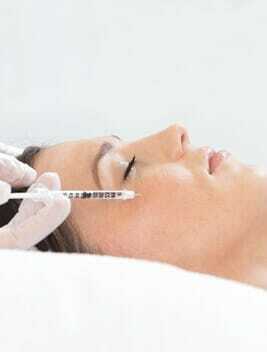 The results of Botox lasts for 3 to 4 months and for fillers, you should remain wrinkle free for up to 6 months. Should you wish to find out more about the best type of wrinkle fillers to suit you, why not give us a call to book an initial consultation. Upon examination of your face, we’ll be able to advise you on which treatment will be more beneficial to you. Everybody ages in an individual way and we offer each of our customers a treatment plan that is entirely bespoke and based on their needs. Please get in touch our friendly team here in Mayfair.